Wow, it has been a long long week around here. With the basement flooding on Monday and then me getting sick right after. But the good news is I am here to share the new sketch for this week. Welcome to week 107 of my Monday Lunchtime Sketch Challenges! I hope you choose to play along. If you do don't forget to add you link to Mister Linky at the end of the post! 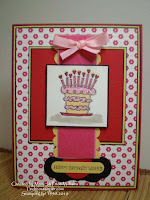 And my card which as usual is combined with the new Latenightstamper's challenge for the week. This weeks theme is butterlies. I am so glad since I have butterfly sets but seldom use them?? Weird how that happens. I love them, have to have the, then never use them! Go figure. Here is my card for this double challenge. I am not sure I like it--seems hard to create when you can barely breathe! Fun cards this week! Thanks to all of you who played along. 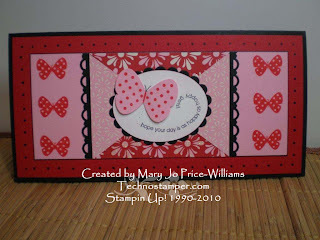 This card was created for the featured stamper challenge on Stampin Connection. 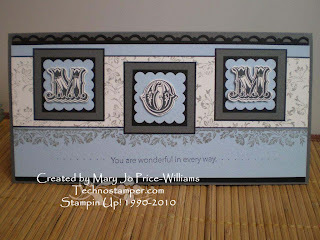 (site stampin up created for demos). 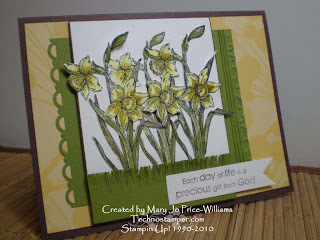 This weeks featured stamper is Mary Brown. She has an amazing gallery. Anyway here is my card for this challege. Be right back with a re-cap of sketch challenge 106 and then the new sketch for the week. Hopefully I have it right this week. Remember I posted a card for this same challenge last week--but it was postponed. Silly me. 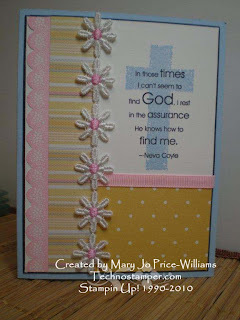 So here is my new card for this challenge. The challenge is to use two or more stamps on your card and you can not count words. 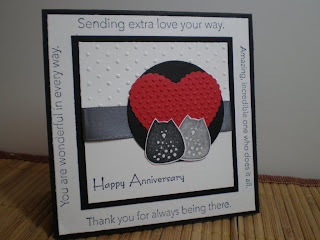 If you seen last weeks you may remember I used lots of stamps, lol! Not so many this week. Just the two and a word stamp. The border is from the Eggcoutrements set and the cross is from Refuge and Strength. 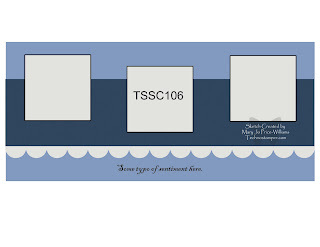 Other: ribbon, marker, scallop corner punch. Be sure to check out the rest of the teams creations HERE. I am off to bed, I may even have to break down and go to the doc tomorrow! Man I feel AWFUL! I can't believe I am sick! I am sick of being sick. I think I used a whole box of tissues since I went to bed last night. Probably from standing in water stamping--instead of cleaning up the silly flood. But hey, everyone needs a break ever now and then, right? I did a little combining of challenges againg this morning. Imagine that! Dusty Durango, Crushed Curry, Soft Suede. Hope you have a happy day. My sister is coming in from Texas today! Hope she was praying for snow cuz we sure have it! I have so much to do today so I am doing the major multi-tasking thing! I needed a card for a friend who just lost her husband to cancer. I also combined it with a bunch of challenges. 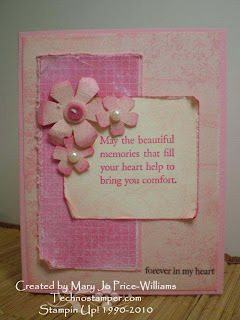 Here is my card--I am actually enjoying this Vintage style--kinda. If I am actually hitting the target and it is vintage looking, lol! 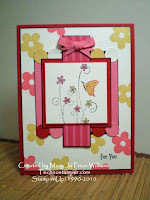 Today's challenges on the Stampin Connection are a scrapbook sketch and a card sketch. Of course I had to take a couple of breaks in between cleaning up the flood in my studio (yea! fun times at the Price-Williams household). 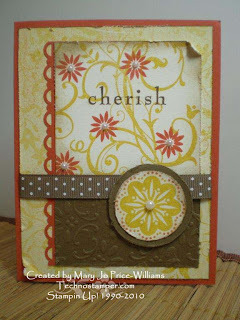 I combined the scrapbook sketch with the Latenightstampers challenge -- all things vintage. 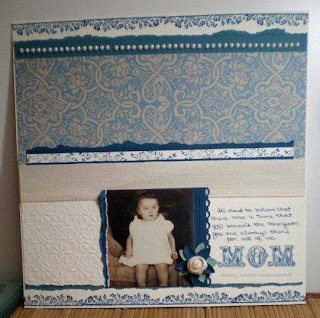 It is a 12 x 12 page with my mom as a baby. First ever vintage style page. It was fun to make actually! The rose is made from the twill tape and the five petal flower punch. And then the sketch challenge.. I love these daffodils. Aren't they beautiful. Hope you are having a fabulous day. I need to go do more cleaning--the basement is getting cleaner and the rest of the house is getting trashed in the mean time. NEVER ending, lol! Oh well at least I was able to take a break to stamp--life is good! Check out all these fabulous samples! Great job everyone one. Thanks so much for playing along. Remember to visit the creator's blog you can click on the link above the sample.